Be the first to know what’s happening in the Lab. Sign-up below to receive the Mind Storm Labs e-mail Newsletter. 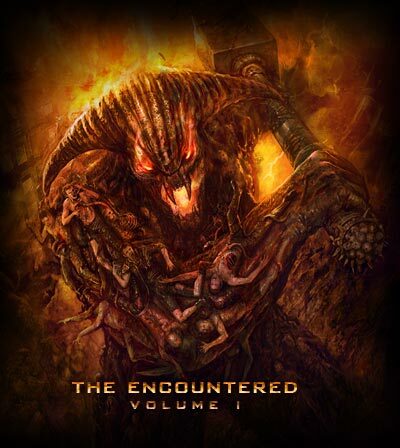 The Encountered: Volume I contains over 200 creatures and 285 pages, with full color illustrations, orthographic views, rules for creature creation, templates for modifying or customizing creatures, an encounter management guide and several optional factions. The first print run of The Encountered: Volume I has begun. If yo haven't already, pre-order your copy! We'll have more information about the launch and upcoming products in the next few weeks. Robot Viking just posted their review of Alpha Omega. "Wizards of the Coast's recent Star Wars RPG books set a high bar for sci-fi RPG design, but Mind Storm has outdone them." You can read the full review at Robot Viking. The Mind Storm Labs creative team were interviewed by Atomic Array this week. The MSL team talks about the game, upcoming products and possible future ventures. Thanks to Ed Healy and Rone Barton for a great interview about our RPG. Mind Storm Labs Releases a Preview of "The Encountered: Volume I"
Mind Storm Labs is pleased to announce the first preview for the upcoming Alpha Omega creature manual, "The Encountered: Volume One". This sneak peek gives players a sample of 10 creatures from the 200 monsters and fiends that will be found in The Encountered. This is a Flickr badge showing public photos from mindstormlabs. Make your own badge here.